Bespectacled Mitchell Santner smashed Ben Stokes into the stands off the final delivery to guide Chennai Super Kings to a thrilling four wicket victory in an IPL game which saw a very public outburst from winning captain Mahendra Singh Dhoni. CSK recorded their sixth win in seven games as they made a rough weather of a modest 152 run target before Santner's six sealed in a dramatic final over in which CSK needed 18 runs. Dhoni on his part scored 58 off 43 and added 95 with Ambati Rayudu (57 off 47 balls) for the fifth wicket. However Stokes got him with a yorker and a clear waist high no-ball to Santner was ruled out by umpire Ulhas Gandhe after trying to raise his arm. This prompted an angry Dhoni to enter the ground and literally blast Gandhe before leg umpire Bruce Oxenford calmed him and sent him back before Santner finished it off in style spoiling a brilliant outing from Jofra Archer (1/19 in 4 overs). Dhawal Kulkarni bowled a perfect away going delivery that squared up Shane Watson (0) while Suresh Raina (4) was beaten by a direct throw. Faf du Plessis (7) soon followed the suit as Rahul Tripathi took a well judged catch at the deep mid-wicket boundary off Jaydev Unadkat's bowling to reduce CSK to 15 for 3. Kedar Jadhav (1) didn't last long but it took an air-borne Ben Stokes to pull off an incredible catch at backward point off Jofra Archer's bowling. 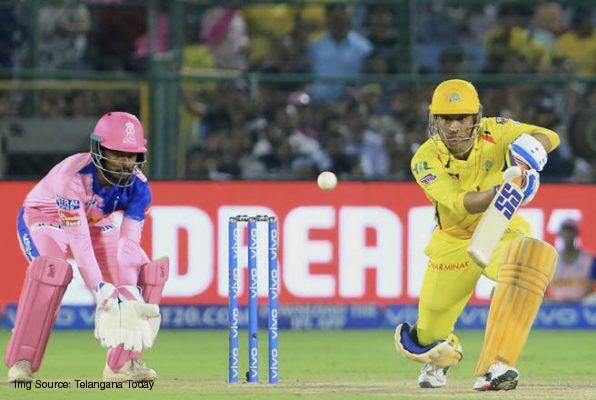 Earlier, Chennai Super Kings produced yet another disciplined bowling effort to restrict Rajasthan Royals to a modest 151 for seven in 20 overs. Save Jos Buttler (23 off 10 balls) at the top of the order, none of other Royals batsmen looked the part as CSK skipper Mahendra Singh Dhoni's immaculate reading of the track once again helped the defending champions. Left-arm spin duo Ravindra Jadeja (2/20 in 4 overs) and Mitchell Santner (1/25 in 4 overs) checked the run-flow as Royals batsmen were always playing a catch-up game. Even Imran Tahir (0/28 in 4 overs), who went for a few more runs compared to the other two spinners, ended with decent enough figures. Royals skipper Ajinkya Rahane (14 off 11) failed once again with seamer Deepak Chahar (2/33 in 4 overs) trapping him leg before. Buttler belted Shardul Thakur (2/44 in 4 overs) for a few boundaries before he mistiming one which was easily caught by Ambati Rayudu. Once Buttler was gone, Royals lost the momentum as wickets fell at regular imtervals. Steve Smith (15,22 balls) struggled once again as he slog swept Ravindra Jadeja towards deep mid-wicket only to find Rayudu. Samson also top edged a sweep which was caught by substitute fielder Dhruv Shorey. Rahul Tripathi's struggles in the middle-order continued while Ben Stokes' 28 off 26 balls wasn't good enough. It was Shreyas Gopal, who struck a few meaty blows en route his 19 off 7 balls to take the target past 150 despite the home team playing as many as 42 dot balls.